Pitzer College is one of the seven independent components of the Claremont, California consortium of colleges near Los Angeles. Last November, TTN’s Alliance for Academic Freedom issued a statement opposing a faculty BDS resolution at that time (“Eroding Academic Freedom“). The issue has come up again with a faculty vote to end the college’s study-abroad partnership with the University of Haifa. He taught sociology at UCLA for many years before become top VP at the Ford Foundation, then Dean at UC-Santa Barbara, then Pitzer president. As a leading African American scholar and administrator, he’s broken many barriers, and he’s always been true to his progressive principles. He pushed the Ford Foundation to significantly increase its funding of grassroots organizing, for example. His book on “Black Wealth/White Wealth” was pathbreaking – the first major study to account for, measure, and examine the legacy of racial redlining/housing discrimination, and the huge gap in wealth (not just income) along racial lines. A decade later, the dramatic decline in black wealth and the widening gap between black and white wealth – the result of Wall Street’s risky, reckless and predatory policies – vindicated Melvin’s analysis. 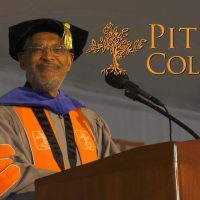 Here is Melvin’s statement, explaining his decision: https://www.pitzer.edu/president/message-to-the-pitzer-college-community-from-president-melvin-oliver/. The resolution itself would apparently suspend the study-abroad program until “the Israeli state ends its restrictions on entry to Israel based on ancestry and/or political speech.” This is actually pretty tricky. On the one hand, the Israeli entry law is definitely discriminatory and objectionable, and it would not be irrational for Pitzer to suspend programs that do not treat all students equally. On the other hand, of course, Pitzer has programs in China, Cuba, Kyrgyzstan, Turkey, and other countries with restrictive visa laws and restrictions on education, so it is obvious that the visa requirements are not the real reason for the resolution.